On July 20, 1991, Studio Ghibli released an adaptation of the manga Omoide Poro Poro by Hotaru Okamoto and Yuko Tone. 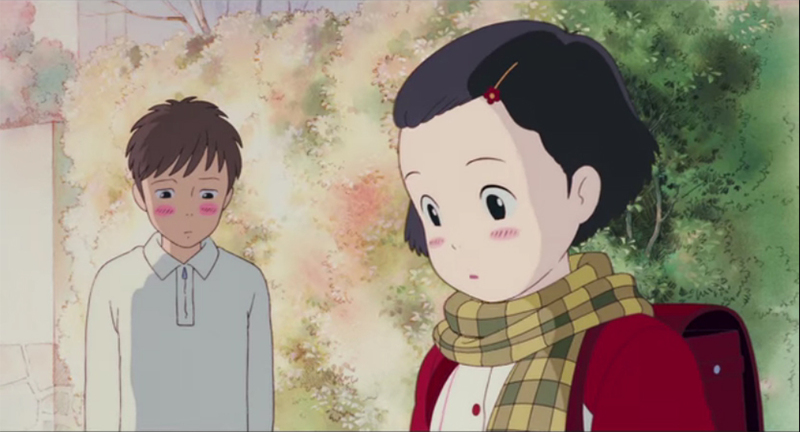 Directed by Isao Takahata and recognized by westerners as Only Yesterday, it was a surprise success becoming the highest grossing film of the year in Japan. This was unexpected given that the film was a realistic drama more for adults instead of a fantasy venture that could appeal to children. It is perhaps because of this that the film took roughly 15 years for it to be released officially in other countries. Nearly 25 years after its initial release, Only Yesterday finally gets an official distribution in North America through GKIDS. Furthermore, its also receives a long-awaited English dubbing. 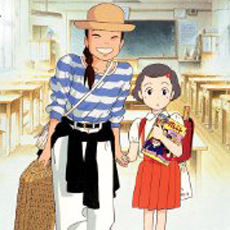 Only Yesterday tells the story of Taeko Okajima. In 1982, she is a 27-year-old, unmarried career woman living in Tokyo. She is going to spend her vacation time visiting the family of the elder brother of her brother-in-law in the rural countryside. But she’s not traveling to Yamagata to simply get away from city life. She is going to help with the safflower harvest. During her journey at night on a sleeper train, she unconsciously begins to reflect back to her life as a fifth grader in 1966. And as her vacation progresses, making new friends and enjoying the scenery she has always wanted to visit, Taeko begins to wonder if perhaps the memories of a difficult experience growing up is informing her about the girl she once was, the woman she currently is, and who she may become in the future. 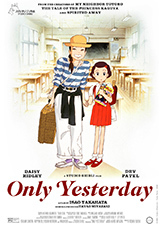 Only Yesterday is a wonderfully told story exploring the emotional, and sometimes psychological, complexities of a woman both in her youth and in adulthood. But I will admit that this is not an easy movie to sit through as a result. Much can be directed to the sequences dealing with Taeko’s childhood. With the exception of a moment where it is revealed that a boy in another class has a crush on her, her sense of wonder and excitement growing up come crashing down with challenging doses of reality that is likely to leave audiences very uncomfortable. Most will probably point to a moment where she and her fellow classmates are informed of menstruation. But there are other moments that I feel were far more tense, and they all deal with her relationship with her family. To see a child having such experiences that do not conclude positively is sure to make viewers of any age feel uneasy. Yet I find beauty in the storytelling from how this difficult look at childhood runs juxtaposition to a more pleasant adulthood for Taeko. Here is a woman who seems to have become a mature, open-minded individual and manages to find something joyful to experience. There’s a great moment when she begins to harvest safflower where she narrates their usefulness and the comparison between how they were picked before to how they are picked now. As subtle as the scene is, and lacking anything really vibrant other than the colors and animation, I feel it is nonetheless a fascinating study into her character, having become a patient and appreciative person. This unique sense of wonder in adulthood is further expanded upon with the bond she forms with Toshio, a second cousin of her brother-in-law. She watches with admiration the happiness he has for the life he’s living despite its challenges. For a film that is 25-years-old, Only Yesterday holds up extremely well. There really isn’t anything about the animation that makes it look dated or less lively. I believe this has to do with Takahata utilizing two differing animation styles in telling Taeko’s story. The scenes set in her adulthood evoke more realism with the facial design, the look of the scenery in both the city and the countryside, and the use of light and shading in the colors. The scenes set in her childhood are a little more fanciful and as they would have looked in the manga along with some saturation in the colors. I found this to create the effect of how dreamlike Taeko’s childhood has become while showing her that the present is as bright, if not brighter, than she could have thought it would be growing up. Obviously, the key point of reviewing a film that is 25-years-old is that it has officially been dubbed in English for the first time. In what is marked as her first role post-Star Wars: The Force Awakens, Daisy Ridley provides the voice of the adult Taeko. Many will find it curious that she speaks with an American accent for this film. I imagine it might have to do with consistency as virtually everyone else in the film has an American accent, it would seem out of place for her to have a British accent. And yet after watching the film, I don’t think it should be seen as that big of a deal because she does such a splendid job that you kind of forget she’s not speaking in her natural voice. Also on the cast is Dev Patel as Toshio. Like Ridley, Patel is a British actor speaking with an American accent in the film. While his accent is a bit more noticeable than Ridley’s, it’s not distracting. He does a fine enough job with a simple, seemingly laid-back voice that’s pleasant to hear. Voicing young Taeko is Alison Fernandez and she really hits all of the emotional range a fifth grade girl in 1960s Japan faces. At times, she becomes the true star of the show because of it. Those with keen ears may pick up on some familiar Star Wars voices making up the supporting cast. They include Ashley Eckstein as one of Taeko’s older sisters Yaeko, Grey DeLisle as their mother, and Mika Futterman as Toshio’s Granny. Other notable voices include Tara Strong as a friend adult Taeko makes in Naoko, Laura Bailey as Taeko’s oldest sister Nanako, and Stephanie Sheh as one of Taeko’s childhood friends Aiko. Music is also of interest with the film. The score by Katz Hoshi is soothing and evokes the kind of music Joe Hisaishi would compose for Studio Ghibli. But what’s fascinating about the music is its absence. I found in a lot of key scenes the music is not heard. 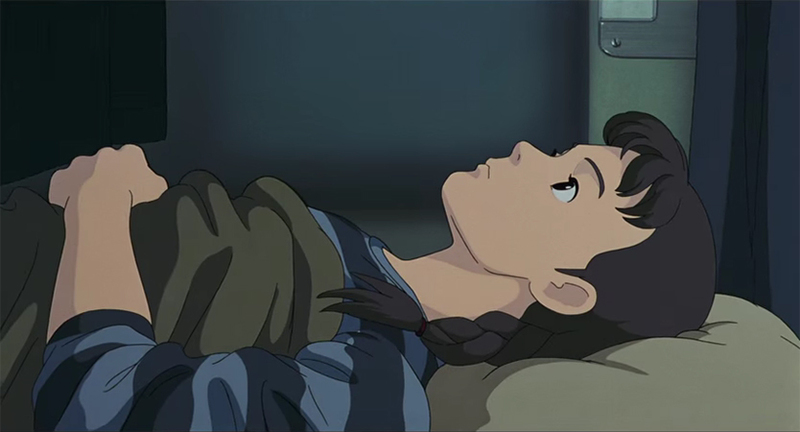 This is a unique storytelling method and really hits home the reality of whatever situation young Taeko is facing, adding a kind of weight that I’m not sure would have been present had there been music playing in the background. Those again with keen years will notice the song playing at the end is a Japanese variation on the Bette Midler song “The Rose” called “Ai wa Hana, Kimi wa Sono Tane (Love is a Flower, You are the Seed)”. Performed by Harumi Miyako, it rhythmically fits with the score and the film’s story. 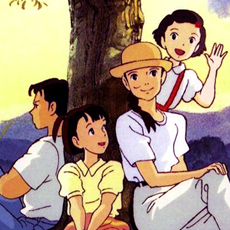 Only Yesterday really is a testament to just how strong of a storyteller Isao Takahata is. As with the film he made prior Grave of the Fireflies, he crafts a beautiful, dramatic tale of life through all of its up and especially its downs. If audiences like to compare Hayao Miyazaki with John Lasseter for their ability to tell fantasy stories that touch hearts of any age, I’d dare say you could compare Takahata with Pete Docter for their willingness to tell sometimes painful stories from the heart. The films may be difficult to watch more than once, even the first time can be tough, but you appreciate just how good they are and the emotions they conjure from within one’s soul.